Nothing very exciting today. 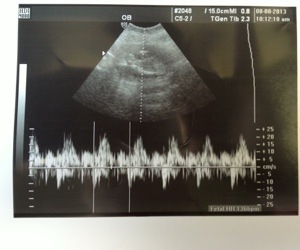 Well, I mean its always exciting for me to hear our baby’s heartbeat! But nothing new really to report. Things are going well and we are now out of the first trimester. 🙂 YEAH! But of course we are not out of the woods. My Nuchal Translucency screening tests all came back negative so that was good news. My preop appointment today was just to go over the cerclage procedure and answer any questions I may have. Of course there is risk involved. But I know what the alternative is and that’s a road I would rather not travel again. So I will be welcoming any and all prayers and positive vibes for my surgery on the 19th of this month. The procedure itself takes about 15 minutes and then I will recover in labor and delivery for about 3 hours so they can monitor me and make sure my uterus stays quiet. Lol Sounds funny I know. Then rest for 2-3 days to recoup and hopefully back to normal. This entry was posted in cancer and fertility, Healing, pregnancy after treatment, Recovery and tagged Fertility, Pregnancy and Breast Cancer by surviveber. Bookmark the permalink.